AADL's website was cited by the American Library Association (ALA) as the best library website for libraries with budgets of $6M or more. But it was Jenny Levine's reference to it as "The Perfect Library Blog Example" that convinced me that I had to go see the library that has so involved its community, it has a Superpatron who gets invited to speak about his experience as a user at library conferences. As its category in ALA's annual awards suggests, AADL has money. But could it be that they were able to "buy" their community's support? I don't think so. Leadership must have had something to do with it. I got to visit the Yale University Library because I met Rich Richie, curator of Yale's Southeast Asia Collection, when he bought some books from PCIJ while I was still working there. As with just about every librarian I meet, I introduced myself and thought, "Well, maybe we'll meet again someday." In this case, "someday" came sooner than expected when I learned that a former classmate was working in New Haven, and an editor I met at the SSP Annual Meeting gave me a third reason to pass by New Haven, CT, on my way back to Boston from New York. I was amazed at the depth of Yale's Philippine collection, but it would not be until I got to Toronto—and learned that many of the books I was borrowing via inter-library loan were from Yale—that I realized that I will eventually have to go back and spend more than just a day looking around. Rich also introduced me to other Filipinos in the Yale library system, including Edith Baradi, who I would later realize is the author of a bibliography important for my own research. Edith then introduced me to one of her fellow librarians, who showed off her Philippine-made bag when she learned I was Filipino. Finally, I was under the impression that Yale's Sterling Memorial Library was a church converted into a library, but according to the brief history on the website, it was actually built and designed to be a library. The photos were taken on 3 August 2006. During my first week in the United States last June 2006, I got an email from Stephen Francoeur, another blogger, that demonstrated just how blogging can be useful as a networking tool. Apparently, he'd noticed that I had just arrived in his country, and offered to take me around his library in case I passed by New York. He added, "Having been to the Philippines once and having received a very gracious welcome from everyone I met, I'd like to return that favor." And that's how I came to visit the Newman Library on 28 July 2006. I had not heard of Baruch College before, and did not know that it had been at the top of the list of "the most ethnically diverse institutions of higher education in the United States" (US News & World Report) for the past eight years, so I was pleasantly surprised to find a Philippine flag on the library's premises. And then there was the counter where students borrowed laptops (! ), which just blew my mind. Computers may be used on the premises in libraries in the Philippines, but I don't know of any that actually lend more than a hundred of them to students. For free! It was a very short visit, so I did not get to meet Stephen's Filipino-American wife, but since I hope to go back to New York City in the next few years, maybe our paths will eventually cross. Incidentally, Stephen has been a victim of plagiarism. See his post entitled, "My bit role in a Wikipedia soap opera." The photos above were taken at the Boston Public Library's Central Library in Copley Square, Boston, MA, on three separate days from 7 July to 8 August 2006. What I found most striking about the BPL was its Tagalog collection, about half of which was made up of romances. I tried to find out what the circulation patterns were, but this was not readily available. I was told that I would find other Filipinos (i.e., nurses) at hospitals, but except for one former classmate, I didn't run into any other Filipinos. So I don't really know whether the romances were acquired to fill an expressed need. Something else worth mentioning is that it was with BPL that I was first able to ask an online reference question via its "Ask A Librarian" service—even without a library card. Those with library cards can even access databases—from anywhere around the world—just by inputting their library card numbers. The photo of the map in "Islands Philippines" is from the Journeys of the Imagination exhibit, which can now be viewed online, of the Norman B. Leventhal Map Center. Rizal Day, a national holiday in the Philippines, is commemorated every December 30, when Jose Rizal was executed 110 years ago. Rizal is probably the best known Filipino who has been killed because of what he wrote. Unlike the Filipino journalists whose deaths have turned the Philippines into the most dangerous place after Iraq for press people, Rizal was actually "tried" for his "crime"—writing about Spanish abuses in the Philippines, primarily in Noli Me Tangere and El Filibusterismo. these thousand copies exerted an explosive effect, were of decisive influence and changed as no other event had, the course of Philippine history at the end of the nineteenth century. Noli Me Tangere literally means "touch me not," but has been translated as The Social Cancer and The Lost Eden. El Filibusterismo (subversion), meanwhile, has appeared as The Reign of Greed and The Subversive. "How Lovely is Your Dwelling Place"
It's always good to remember that Jesus Christ was not born in a hospital. He did not receive gifts from Santa Claus, either. What about the poster above? What about it? I found that poster on a blog, not the usability-challenged NBDB website. More photos are available on the Super Inggo blog. So am I just going to whine about this? Nope. It's quite clear that we can't just rely on NBDB to promote its own campaign. Super Inggo and Beatriz have shown the way. At this point, the code links to the original—and very American—Get Caught Reading website. But until NBDB comes up with a page worth linking to, this will have to do. This is where it all started. 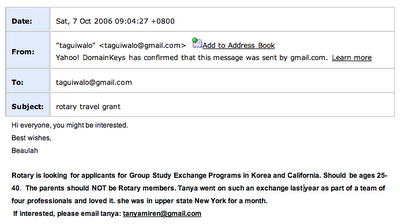 I received this email and immediately inquired about the said group study exchange program. Then, I was told to send my resume to Mr. Mario Magat of the Rotary Club of Alabang and I did. 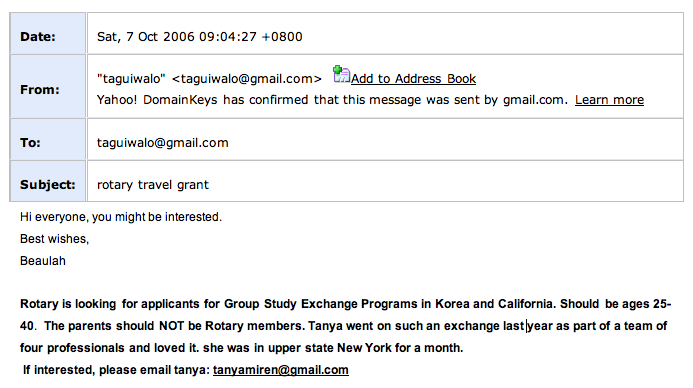 I learned more about the Rotary Group Study Exchange (GSE) from graduates of the program, by reading articles about it, and from the rotary club’s web site (www.rotary.org). The more I got information about the program, the more I wanted to become part of it. The first interview was last November 15, 2006, held at the Makati Sports Club. After the panel interview, we were asked to pass the official Rotary GSE application form with the essay of intent. The week after the first panel interview, Rotary called, on the day itself, for the final interview. It was conducted again at the Makati Sports Club. I was the last person to arrive, as I was also on the first interview, because I came from work at De La Salle Santiago Zobel in Alabang. There were twelve applicants, including myself and three panelists. I was shocked with the fact that I was competing with a doctor, an engineer, three lawyers, etc. I was quietly thinking what could be the question. After the second to the last applicant answered, the question was thrown at me. I answered and we were dismissed. I was not expecting to receive any email nor a text message from Rotary, as I thought I failed to present my profession in front of the other eleven young professionals vying for a slot on any of the two group study exchange programs and three panelists. Sunday, November 26, 2006, I was on my way home from Baclaran when I fortunately received a text message from one of the panelists saying that I am one of the US Team Finalists. I was with two of my closest friends and my boyfriend that day. I couldn’t believe what I read. I read it three times and asked my friend to read it for me. And yes, my first name—correctly spelled—was in it. This will be my first time to travel and I am so proud to be an ambassador of Filipino librarians. I believe that this program will help me in building more libraries, like the Bulacan Library Project that I am currently working on as a volunteer librarian, and in creating efficient library services and programs by giving me a chance to visit libraries and observe library services and programs in California. After four weeks (April 29, 2007-May 27, 2007) of staying outside the country, I will be certainly back with added experience and knowledge that I will be more than willing to share with my fellow librarians. As I am writing this article, I remembered a Canadian library science student who once asked the question: "What do you think is the biggest challenge in library development (i.e., in getting more libraries to be built in the Philippines and adequate collections development, etc.) besides the lack of public funding, what other reasons are there?" I answered, "We need more librarians who will get out of their comfort zones and act in making the realization of information equity happen." FO: Bukas Palad's "Humayo't Ihayag"
In the spirit of the season, watch the video of this song and reflect on the fact that although it's not really a Christmas song, there is so much joy in it that it gets sung a lot during Christmas. The lyrics below are from the Bukas Palad website. The translation is mine. The SLA Business and Finance Division is again offering an International Travel Award so that "a business information professional from a developing country" can attend the 2007 SLA Annual Conference, in Denver, Colorado, from 3-6 June 2007. Take note, they're not necessarily looking for librarians. So if you happen to be working in a business-related special library (e.g., PSE, SEC, ADB) or a business school library (e.g., AIM, UP, DLSU), why not apply? Who knows, it might change your life. That's what happened to me. last year i was able to attend my first-ever library conference in toronto through an international travel grant from SLA's B&F division (i'm from the philippines and got my MLIS in 2004). and because two other newcomers to the toronto conference weren't around to claim their free registration for this year's conference in baltimore, my name got picked in the raffle. when i got back to manila, i knew i wouldn't have money to go back this year even though i had free registration. i didn't think it was likely that another SLA division would give me another travel grant, so i kept my eyes open and saw that the society for scholarly publishing was looking for applicants for its conference in annapolis just a week before the SLA one in baltimore. i applied for it and got it. the SSP and SLA conferences were good not just for networking but the content. SSP was exactly right for me because i had some online and offline publishing experience on the side, and open access was a big thing at the conference, which was smaller than SLA's. in contrast, SLA was so huge that i had to spend more time choosing the sessions i wanted to attend. but since this was my second year, it felt good to see familiar faces. there was also an informal get-together for bloggers, and that was just great. now i'm back in toronto where i just started my phd, for which i have a fellowship and which i looked into last year while i was here for the toronto conference. just a few hours ago i was talking to stephen abram, SLA president-elect, who was very nice and whom i never thought i'd be able to chat with for more than two seconds. well, he ended up giving me some very useful advice over about twenty minutes regarding my phd AND winter in toronto. i'm planning to go to more conferences as a student, and avail of the cheaper membership and conference rates. but i'm going to keep on applying for grants, too. going back to the last of the questions in the original email—"Did it change your life? "—it sure did. After a long, long time, the Archives link of Philippine Star is working. It seems to be so new that the search engines haven't spidered anything beyond 2006. The calendar links to dates from 1 January 2000 to 31 (?!) December 2006, but unfortunately, the first week of January 2000 and the entire August 2000 display the following message: "SORRY! No Archive For This Date." I first met Jose Escarilla at SLA's annual conference in Toronto last year (see SLA 2005). Actually, to be more precise, he found me. but i already had a place to stay, so i had to decline. and then i had difficulty finding a place to stay in arlington, where i was attending another conference. this time i asked jose, and he referred me to jim arshem, who very willingly took me in. finally widharto, an indonesian whom i also met on the same day i met jose last year, asked me if i knew anyone with whom he could stay in baltimore, so i forwarded his email to jose. attached is a photo i took in baltimore. jose hosted jim and widharto in his hotel room. 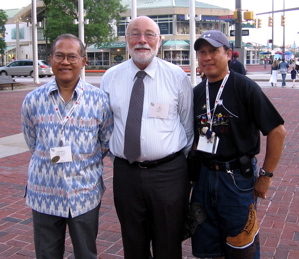 from left: widharto, jim, jose. Jose G. Escarilla Jr. has been called a brat, Good Samaritan, troublemaker, spoiled, a global freeloader, Jose Loco, and a survivor. And that’s just from his friends and associates. On December 22, SLA member Escarilla will be called something else: retired. After nearly 40 years as a corporate librarian (the last 21 years with the General Electric Company) and a day before his 60th birthday, Escarilla will depart the GE corporate offices in Fairfield, Connecticut, and see what new challenges he can tackle. He has many accomplishments: marathon running, singing, ballroom dancing, tennis, and extensive volunteering. Upon retirement, his new endeavor will be that of a full-time world traveler. Some wanted Escarilla to stay, but he felt it was time to move on. There were changes occurring at GE with new management, and he believed the timing was best. He was born in Sipocot, Camarines Sur, Bicol Province, Philippines, in 1946 and raised and educated in a middle-class family where he helped his parents with their variety store and restaurant. But he has always been independent minded and free spirited. His drive has been his interest and ambitions. To Escarilla, nothing seemed impossible. Upon completion of college at the University of the East, Philippines, with a major in library science, his first job was working as a student assistant in the university library. His first job as a corporate librarian was in the technical library at Philippines Airlines (PAL). He felt lucky to secure this job because he was told that people were not hired at PAL without knowing anyone on “the inside,” and he knew no one. He applied blindly. In 1970, after two years at PAL, he requested a free ticket to America. He had three plans: find permanent shelter, find work, and find an immigration lawyer to begin the process of becoming a U.S. citizen. He received his green card in 1975 and became a naturalized citizen in 1980. Escarilla joined a Philippine folk dance group and a singing group soon after arriving in the U.S. That’s where he met his wife—and had his fifteen-minutes of fame in performances at the Kennedy Center in Washington, D.C., and the Lincoln Center in New York City. Finding his first job in the United States was difficult. Through a job posting at the Columbia University Library School, he was hired as a bindery assistant at the New York Academy of Medicine Library. During his two years there, he studied for his master’s at night and graduated with an MLS in 1973 from Pratt Institute in Brooklyn. It wasn’t long before Escarilla became the administrator of the Library Research Center, which had access to information on more than 6 million American businesses, continuous investment analyses on more than 1,700 businesses, the annual reports of 900 companies, and access to over 100 publications. Then, as now, employees were encouraged to visit the center and use the information. Escarilla’s access to the data grew over the years, but the corporate environment began change. The recession of the early 1990s took its toll. Businesses cut jobs, streamlined operations, and introduced multi-tasking into the employees’ standard of performance. In 1992, GE merged its six libraries to form the Corporate Information Research Center (CIRC) as part of the Real Estate Service Operation with a staff of nine. Two years later, GE decided to outsource CIRC to then Teltech (now Guideline). Escarilla never knew why he was chosen to stay over the other librarians—and he never asked, he said with a laugh. “My thinking is because maybe Jack was involved in the decision, and I know Jack.” Jack, being Jack Welch, then the GE chairman and chief executive officer. Escarilla’s office was in the same building as Welch’s, two floors directly below the chairman’s. Escarilla had been featured extensively in the corporate newsletter, and he believes Welch read those newsletters. “I think Jack liked to see those kind of outstanding employees, and probably that’s why I stayed.” When Welch left GE, he held a farewell party with only 150 people in attendance. Escarilla was one of the invited guests. Most of the questions asked of Escarilla today are related to marketing. Some of the executives request articles about them from various magazines or newspapers. One of his more popular tasks is setting out articles about GE and its upper management for employees and visitors. “The corporate librarian must understand the company’s ongoing business concerns and its current initiatives,” Escarilla said about the value of corporate librarianship. “At GE, for example, there are six major businesses and many sub-businesses. And many changes have occurred during my 21 years with the company. My research skills have always had extra value, because I completely knew and understood the company’s business needs. Escarilla has been a member of SLA since 1976. His schedule hasn’t permitted leadership roles in chapters or divisions: In addition to his position at GE, he also has worked two evenings a week at the Fairfield University Library for 26 -years. At one point, he was working seven days a week, but had to cut back for his extracurricular activities, such as marathon running. But he always made time for the annual conferences of SLA, which he has been attending for more than 20 years. “I always have a great time learning new technologies or developments processes but most important is to network with my old and new colleagues.” Escarilla believes he’ll remain with the organization as a retired member. “I love going to the conferences and meeting the people, seeing old friends. I also spend more time with many first-timers at the conference. They are my targets now,” he added, with a laugh. SLA member Widharto concurs with that assessment. The Indonesian information professional at SEAMEO BIOTROP said that Escarilla is “a kind-hearted person and a disciplined man. He cares and is helpful for those who should be assisted.” They first met in 2005 in Toronto and their friendship has grown since. “Jose is very accommodating,” said SLA member and Filipino Librarian Von Totanes. “When he found out that I was attending this year’s conference in Baltimore, he told me that I could join him in his hotel room if I didn’t have any place to stay.” The two first met at the conference in Toronto; since then, they met again in early 2006 when Escarilla returned to Philippines to visit family. Their relationship has been built via e-mail. But come December 22, he will face a new set of challenges. Retirement and leisure won’t be downtime for Escarilla. He plans to play a game of tennis with his 30-year-old son. He’s still trying to decide if he’ll travel to Latin America first in 2007 or do a road trip across the U.S. to visit friends and family. And he hopes to keep in touch with his SLA friends and colleagues. And if a beaming Filipino-American in his early 60s stops to say hello, it’s probably Escarilla on his world tour. Forrest Glenn Spencer is a Virginia-based independent information professional, editor, and writer. He specializes in developing potential donor prospects for non-profit organizations and works with clients as an Independent Collector of Fine Researched Information. 1. Treat everybody the same. Of course, you have to do extra, extra steps when an executive requests information. 2. Have a sense of humor. You can be serious, but you need to inject some kind of humor into it. 3. Have a smiling face whenever you see a client. It means that you are welcoming them with an open arm and willing to help them. 4. Know what other employees do in the organization and talk to them in person. You will need this in the future for referral purposes. 5. Talk to your manager on how important it is to attend SLA meetings for networking, professional development, and information on new products. 6. Go the extra mile to complete the work: Deliver the information in person or e-mail the information in minutes. In other words, get the information quickly and efficiently. 7. 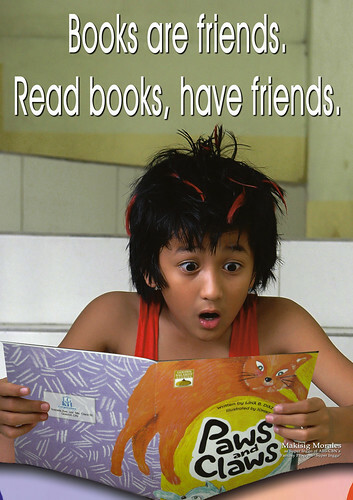 Make friends with other local librarians...just not special libraries but also academic and public librarians. You will need them during crunch time. 8. Always willing to take the job no matter difficult it is but be honest if you can’t do the job. Otherwise, give them an alternative. Ang Kagila-gilalas na Pakikipagsapalaran ni Zsazsa Zaturnnah (The Amazing Adventures of Zsazsa Zaturnnah) started it all. Learn more about the book, download wallpapers, read preview pages and an interview with the author. Zsazsa's creator has a blog. Find out what makes him tick and what ticks him off. Tanghalang Pilipino added actors, songs, sets and costumes to the mix. The site is not about Zsazsa, but you can monitor it to find out when the next performances will be. Read the review by Gibbs Cadiz, too. The trailer above is for the movie that will start its run on 25 December 2006. The website doesn't seem to be working, but maybe it's just not optimized for Firefox. Watch the making-of video on YouTube. There wouldn't be a musical or a movie without them. Multiply hosts the fans who participate in the forums and blog, and post photos and reviews. They even know that there's an official Zsazsa website that's under construction. hi! i just saw most of the video recently. i had seen the video before but only catching the last 30 seconds or so. i noted the blue and white motif and the jumping, but didn't quite get it even though i did like the video as a whole. anyway, this time i saw it from the beginning (i think). and it got me thinking. the blue and white is obviously marian and, though i had to verify it in the bible, the jumping is a reference to john leaping in his mother's womb just before mary utters the magnificat. but there's obviously more to it than just john's prenatal leap because of all the shots of planes, trains and automobiles. my best guess is that it has something to do with infecting others with god's love. evidence? the last shot where the guy about to enter his car decides to forego the comfort of his own vehicle and run after the jumpers. and i suppose this has something to do with what i liked best about the video--that it takes an old song with all the baggage of something that tends to be sung as if at a funeral and reminds viewers that the song is about JOY. who wants to join people who are so burdened by guilt (and boredom and apathy?) that they sing "alleluia" and "santo" at mass as if somebody died? no wonder so many catholics are defecting to more joyful congregations. but i digress. good job! and i hope you make many more that will remind christians that following christ is not JUST about suffering, that we are sustained through the suffering because of the JOY he brings. Was it Mary or Jesus who was conceived on December 8, the feast of the Immaculate Conception? What's the difference between the celebrations on September 8 and December 8? For that matter, what's the difference between the feasts of the Annunciation and the Immaculate Conception? If you're not sure, then you're not alone. There is a logic to the liturgical calendar that is not always explained in religion classes or even in Church. Most Catholics (should?) know that the liturgical year starts with Advent and ends with Easter. The rest of the year is known as "ordinary time," which also occurs between the feast of the Epiphany and Ash Wednesday, the start of Lent. But there are other events that do not follow the Advent-to-Easter cycle. Like the feast of the Immaculate Conception. And the Annunciation. And Mary's birthday. Part of the confusion arises, I believe, because the readings for those three events—primarily Luke's account of the Annunciation—are also read during the Advent season. In fact, the feast of the Immaculate Conception takes place during Advent. So people tend to think that it's part of the preparation for the coming of Jesus Christ on Christmas day. Wrong. If that doesn't make the relationships between the events clear, that's because the events should not be viewed using the January-to-December cycle either. But if you already knew that the birthdates of Mary and Jesus Christ were set exactly nine months after the dates they were conceived, then maybe you'll want to take a look at "Ineffabilis Deus," the papal encyclical that defined the teaching on the Immaculate Conception. Another interesting link recommended by a blogger brings you to the US Library of Congress and allows you to flip through a digital copy of the first book printed in the Philippines, the “Doctrina Cristiana” of 1593. If you happened to read Ambeth Ocampo's column last week and wondered how you could find the "digital copy" of the Doctrina Cristiana he was referring to, he was actually referring to my post entitled "FO: Doctrina Christiana." And even if you tried looking for it using the Library of Congress catalog, unless you knew exactly how to use the catalog and what you were looking for, it would still be difficult to find the book. So if you'd like to tell other people how to find it, just tell them to search "filipino librarian doctrina." House Deputy Majority Leader Eduardo Gullas said the “warehouse-type large-volume libraries” for the public-school system will go a long way to improve basic education and strengthen English language skills among students. This is good news, of course, but the fact that we're getting "praise" releases, instead of hard news, makes me uncomfortable. And, unlike the last press release, this one is not identified as such. The biggest news this time is that total readership for the Top 50 Pinoy Top Blogs (PTB) went up by more than 100 percent from the October 2006 figures. I had to check my computations when I saw the figures, but they're correct. I also considered that, perhaps, the fact that data for October wasn't complete (i.e., due to downtimes) had something to do with it. Well, total unique hits (UH) went up by almost 50 percent from June 2006 figures. Maybe it had something to do with Manny Pacquiao, but something's definitely up. Since June 2006, the 50th blog usually had UH of about 4,000 to 5,000 plus. But the UH of the lowest-ranked blog in the Top 50 this month is at 10,000. So it wasn't just the highest-ranked blogs that brought in the readers. Could it be that the Pinoy blogosphere has finally become a preferred "news" source? Anyway, the Bryanboy controversy—not to mention his wins at the Gay Bloggies—probably contributed to the rise in total UH. But could the call for a boycott have led to Bryanboy's sliding down to 3rd? Not likely. As I've long suspected, most of his readers are not from the Philippines. It's also very likely that Alleba Blog, which got Dugg and came out of nowhere to land on the 12th spot, contributed more than just a few non-regular readers to the mix. But let's see whether it will be more successful than other Digg- or media-driven "ascensions" at retaining its newly-gained spot. Other big gainers in the past month were Kiven (did you know he's a librarian? ), who climbed to 7 from 17; Putanginamo.com (the phrase exists, get used to it), which went to 27 from outside the Top 50; and textmates (from 46 to 29), which like the previous blog seems to be another of the optimized-from-birth blogs that have been moving up PTB in the past months. Blogs that have left me scratching my head are eRadioportal, which doesn't seem to be an SEO trap, but doesn't seem to have gone up to the 2nd spot relying on content either; DZRH Blog, which came out of nowhere last October to take the 11th spot, but has now gone back to where it came from; and Composed Gentleman, which was at 24 last September, dropped out of the Top 50 in October, and is now back at 35. The swings of the last two blogs are too extreme. If you have any theories, let me know. Updated 9 January 2007: The links to Philippine Star and Manila Bulletin are dead, but the one for Manila Standard Today is now working properly. Updated 4 December 2006: The complete press release from PRC, including top 3 schools, top 13 examinees, performance of schools in alphabetical order and the roll of successful examinees is now available via INQ7.net. The list of those granted registration without examination is also available. Philippine Star has the complete list of successful examinees, while the top 13 may be found on the new PLAI-NCR Council Newsletter. Manila Bulletin has the press release, but no list. Manila Standard Today has a link, but there's nothing there yet. And Philippine Daily Inquirer and Manila Times have nothing at all at this time. If you'd like to see what else comes out in the newspapers, take a look at Google News every now and then. It says a lot about the Professional Regulation Commission (PRC) that newspapers and blogs are the ones spreading the news. Its News & Events page has not been updated since June 19 (because of the nursing controversy? ), and the Board for Librarians page indicates that Perla Garcia is still the chair, instead of Corazon Nera. Needless to say, don't go to the PRC website for the latest results. Do we want a perfectly filtered world?